In case you missed it, there’s something new happening with denim at the moment, and it is definitely interesting. 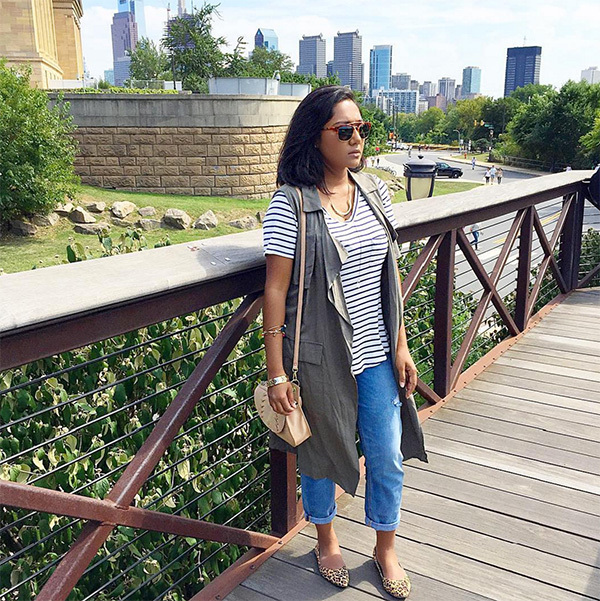 I’m talking about cropped jeans, but I don’t mean ankle-length skinny jeans or old-school capris or even boyfriend jeans – I mean cropped jeans that are relatively skinny, and then flared at the end. They look kind of retro and kind of confusing, almost as if you threw them in the dryer and they shrank but you had nothing else to wear so you just decided to go with it… but in a good way? Does that make sense? Anyway, cropped jeans are in, and they might be a little bit of a style risk, but they are also very cool, like most style risks are. Wearing them, however, can get a little confusing. What do you pair with a statement clothing item that looks like it might just be an accident? I was wondering this myself, especially as a short girl with short legs who can’t always get away with this particular cut of denim without looking like a tree stump, and so I searched through fashion blogger photos and #OOTD spirals on Instagram. I found a lot of really cute outfits, of course, and also some serious inspiration. Want to try out the trend this fall? 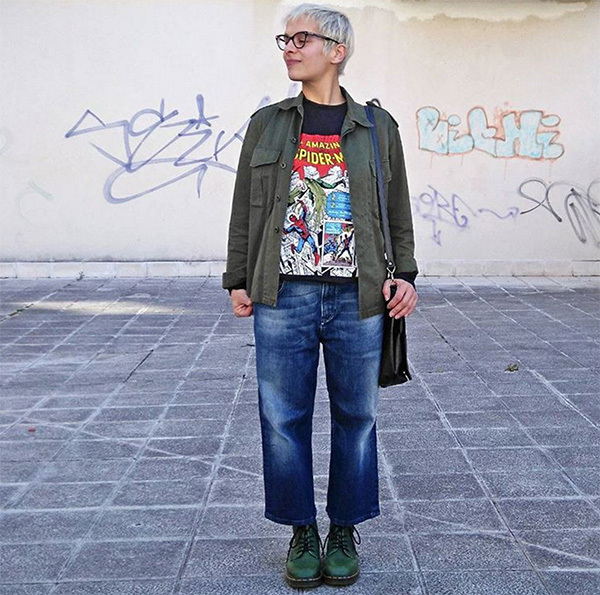 Here are some outfit ideas on how to wear cropped jeans and look awesome. Since this cut exposes your ankles, you might only have a few weeks left to wear ’em so… get on it! 1. Use this length to show off your cutest flats. A white button down keeps the look simple and casual. 2. 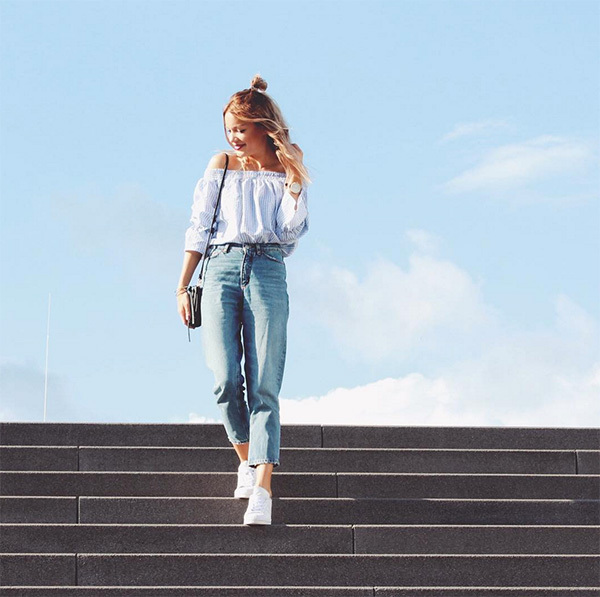 Cropped jeans look great with a simple top and heels. Add a cozy plaid scarf to stay warmer for the fall weather. 3. If you’re worried about the length making your legs look shorter, choose a high-waisted pair to elongate them. 4. With flat mules, a hat, and a leather jacket, your cropped jeans are ready for transitional weather, when it’s cold in the morning and warmer during the day. 5. As it gets colder, opt for ankle boots, letting just a sliver of skin peak out. Add cozy layers too. 6. 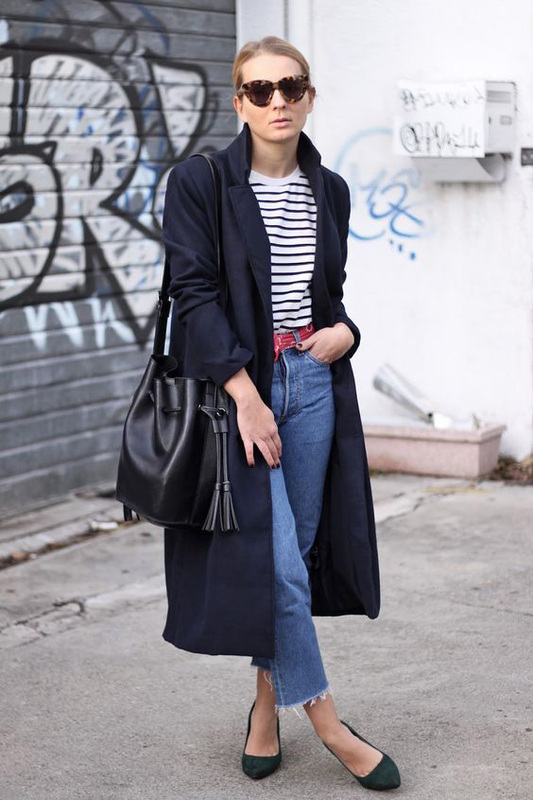 You can pair your cropped jeans with a long coat for extra warmth. The look is so chic! 7. Stay super casual and comfortable with a cozy sweater and a pair of sneakers. 8. 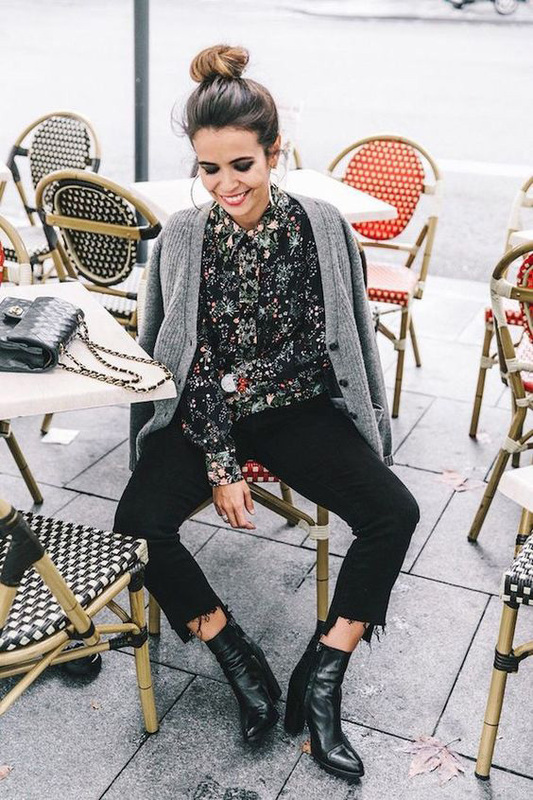 Make frayed hem cropped jeans look more feminine with a knit cardigan and a floral top. 9. Give them a more professional vibe by wearing them with heels and a fitted blazer. 10. 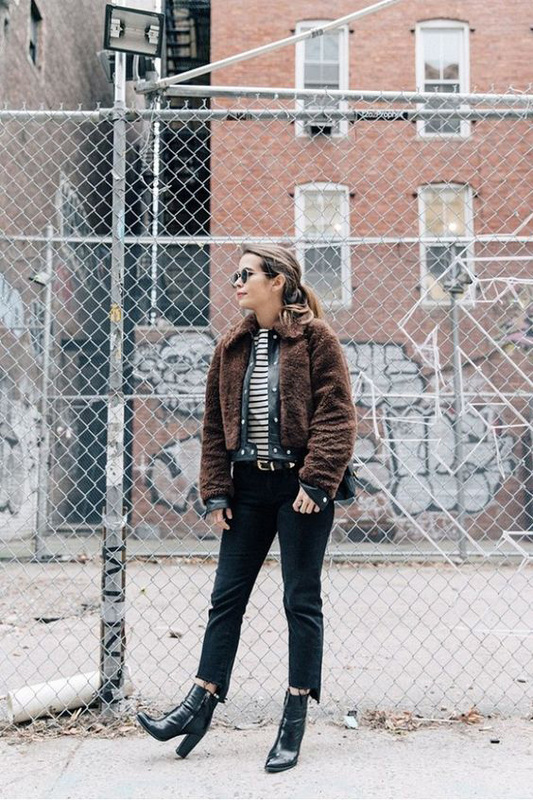 Pair your coolest ankle boots with cropped jeans so they get shown off. From there, keep it simple with neutral shades and a sweatshirt. 11. Make your cropped jeans more unique by cutting a little line down the middle of the hem. Add platform sandals if the weather permits it for an edgy but trendy look. 12. If you live in a warm climate, opt for flat sandals and a crop top. It’s a cute and easy look that always works. 13. 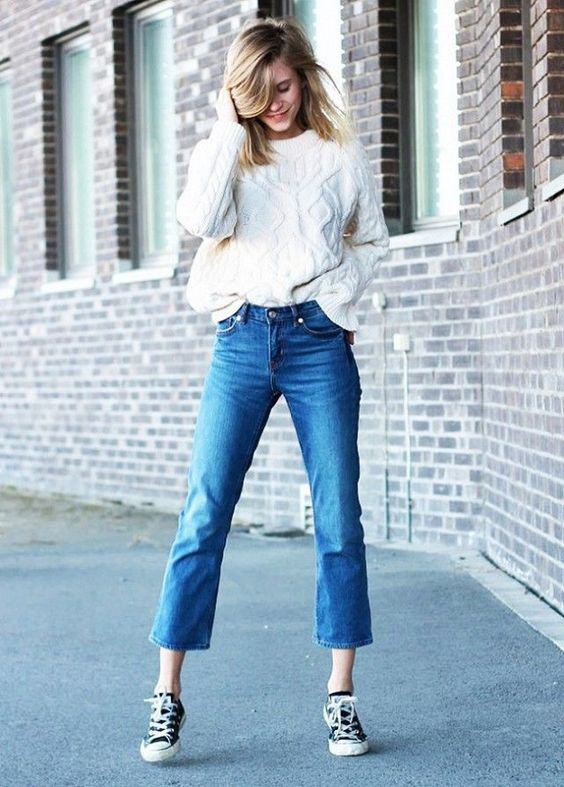 Pair two trends at once: an off-the-shoulder top with a pair of cropped jeans. Sneakers and a half-bun keep this look comfy and casual. 14. Choose a cooler pair of cropped jeans, like ones with two different lengths. 16. Do something totally different by wearing your cropped jeans with sandals and a pair of unique socks. 17. 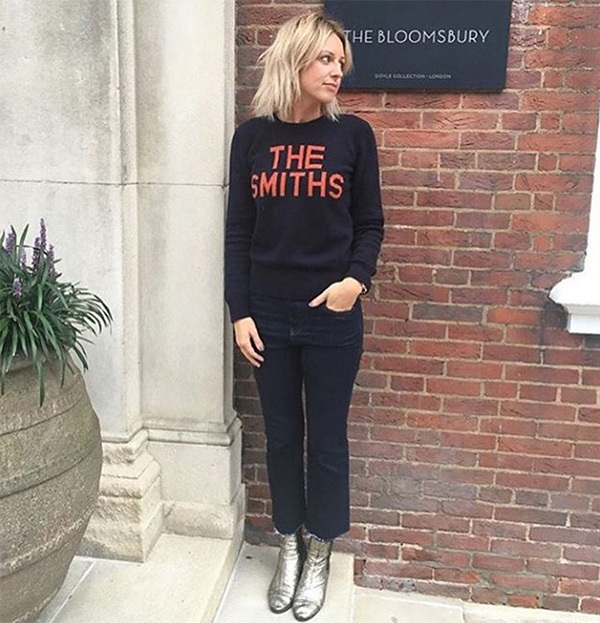 Wear your flared cropped jeans with a pair of ankle boots that go high enough so you can’t see your ankles at all. Very chic, girl. 18. 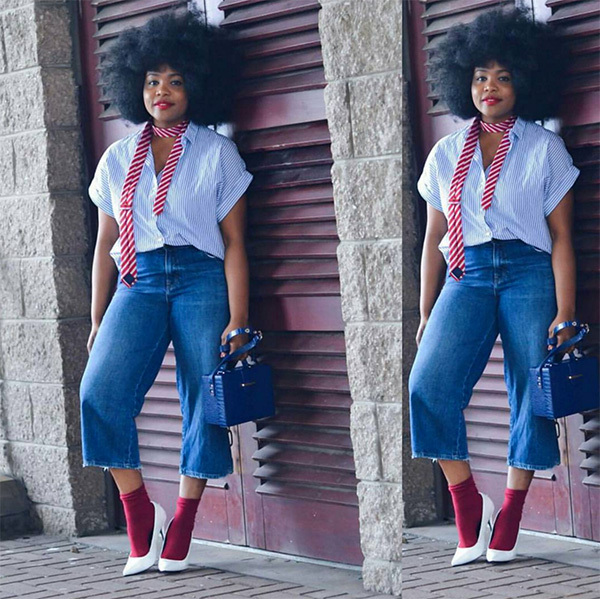 Be totally out of the box with a look like this one: heels and bold socks. It’s definitely making a statement. 19. 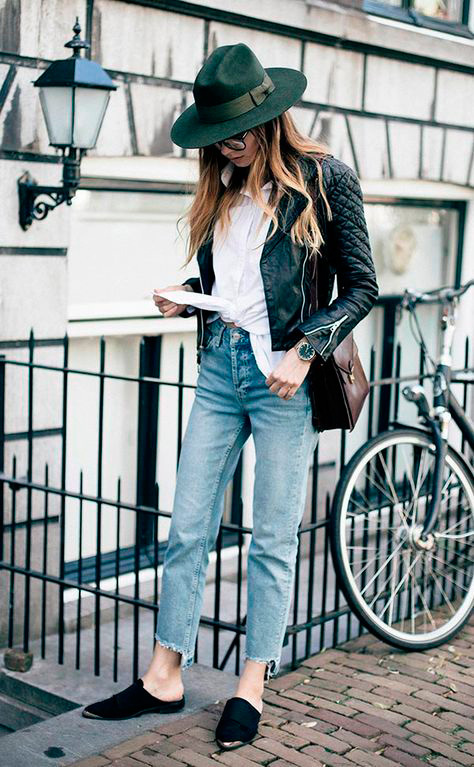 You can also opt for combat boots to wear with your jeans. They’re comfortable and look cool and slightly edgy. 20. 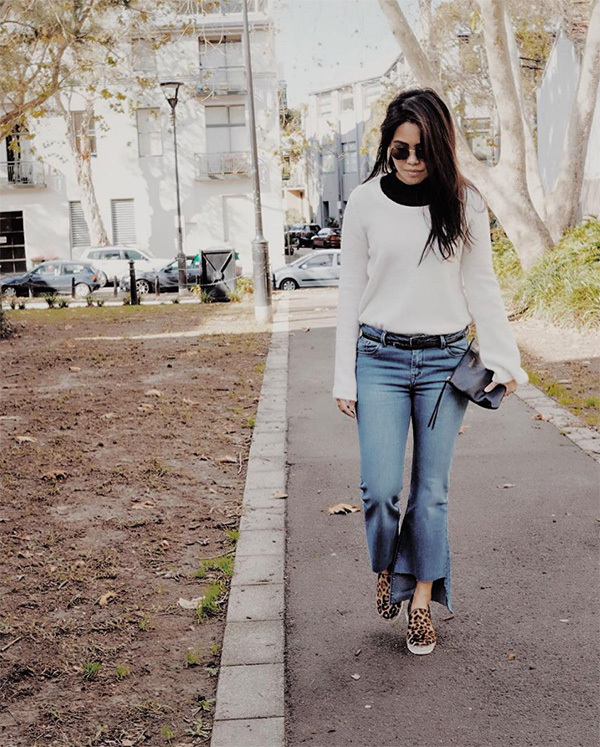 If flared cropped jeans aren’t your thing, try a pair of straight leg cropped jeans. 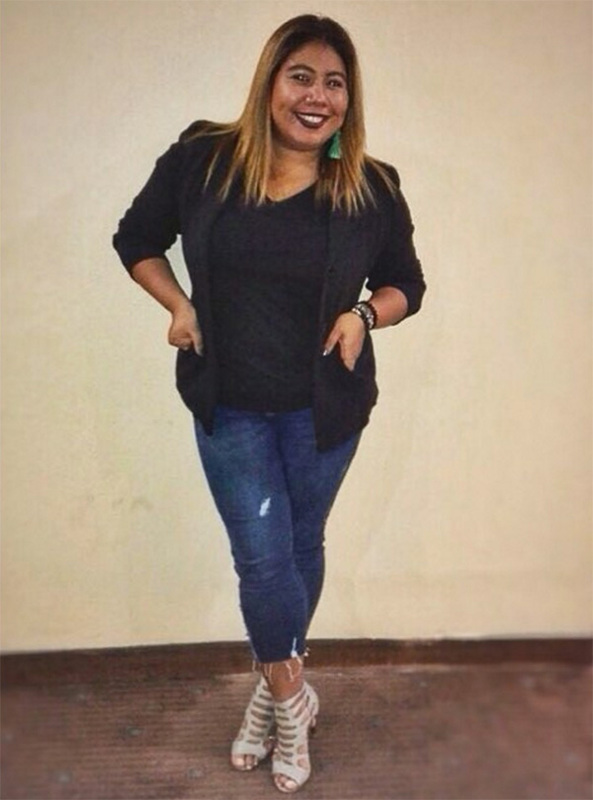 With sneakers and a choker, you’ll look like you just stepped out of an Instagram photo.